Back in July, StogieGuys.com broke the news that Drew Estate would be releasing Undercrown Shade, a new line based on the original Undercrown blend—but this time with an Ecuadorian-grown, Connecticut-seed wrapper instead of a Mexican San Andrés leaf. I reviewed the Gran Toro here. As I mentioned in my review, Undercrown Shade marked the first release blended by Drew Estate Master Blender Willy Herrera not to fall under the Herrera Estelí brand family. I’m not sure if the Undercrown Shade line would have come to fruition, or if Herrera would have been named master blender, had it not been for the success of Herrera Estelí. 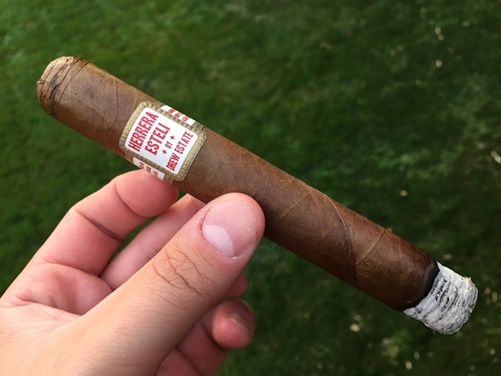 Introduced a few years ago, Herrera Estelí was Herrera’s first cigar since leaving El Titan de Bronze in Miami’s Little Havana and joining Drew Estate in Nicaragua. When it came out in 2013, Herrera Estelí provided some much-needed diversification for Drew Estate’s non-infused premium cigar business, which had previously focused on dark, full-bodied smokes. Herrera brings a more traditional—some would say “Cubanesque”—sensibility to blending, whereas Drew Estate had been firmly full-throttle Nicaraguan. Herrera Estelí employs a golden Ecuadorian Habano wrapper around a Honduran binder and filler tobaccos from Nicaragua. It has a gorgeous triple-cap, a moderately firm feel, and pre-light notes of hay and molasses. The cold draw is clear. On the palate, the Toro Especial (6.25 x 54, about $9) offers a mild- to medium-bodied taste that’s creamy with hints of spice and sweetness. Think syrup, creamy nut, dry wood, and white pepper, all packaged in a toasty texture. The balance and lack of intensity make the vitola easy to come back to again and again, as long as you have the time for a big toro. I smoked three Toro Especial cigars in the past few days for this review. The physical properties were top-notch on each, including a straight burn line, solid white ash, and a smooth draw that yields bountiful tufts of thick smoke. Basically, it’s exactly what you’d expect from Drew Estate. Keep your eyes peeled for Undercrown Shade, but certainly don’t forget how excellent Herrera Estelí can be, especially if you’re looking for subtle complexity and more traditional flavors. The Toro Especial is a good value and a wonderful experience. It earns four stogies out of five.